No Chess Club on early out days. 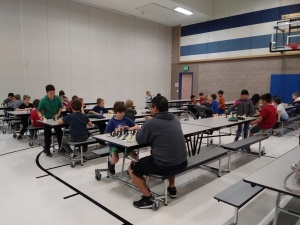 Parent Participation: In order to run a successful Chess Club, we need volunteers to monitor our after school sessions. This does not require previous chess experience. 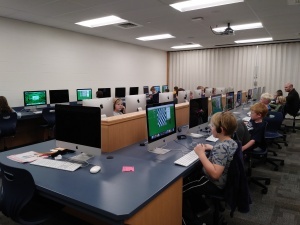 All parents are expected to assist at Chess Club a few times during the year, if possible. T-Shirts: $5.00 each. Youth sizes XS-XL. Adult sizes available, if requested by 9/19/18. Please specify if ordering an adult size. Chess Club members are encouraged to wear their Chess Club shirts on chess club days. Chess sets (optional): $10.00 each, if ordered by 9/19/18. Board/bag color: black, forest green, navy blue, burgundy, red or pink. These are the same large vinyl boards, pieces, and bags that we use for Chess Club. I will play chess at Chess Club meetings. I will not participate in any other activity during this time. I will sign in when I arrive at Chess Club, and will stay until Chess Club is over. Permission from a parent or guardian is needed for early dismissal. I will treat the chess equipment with respect, put away my chess games, and pick up after myself. I will treat others with respect and follow rules of good sportsmanship.